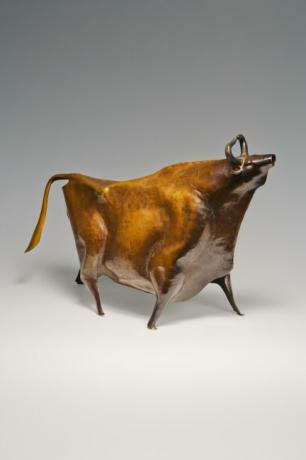 Japanese mid 20th century bronze bull by metal artist KATO SOUGAN (1899-1995). Master bronze artist Kato Sougan was born in 1899 in Kyoto, Japan and died in 1995. He received the Kyoto City Cultural Merit Award in Showa 56 (1981). He lived and worked in Kyoto. He is known for working with shee..
Japanese 20th century vase by Japan Living National Treasure, Tokuda Yasokichi III, born Tokuda Masahiko in Komatsu, Japan. 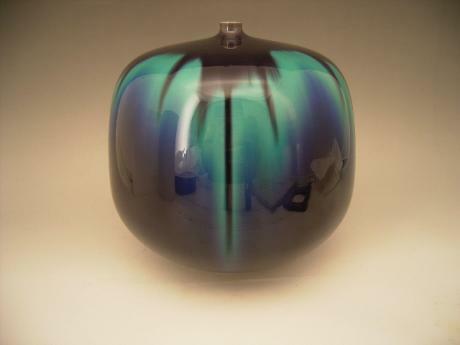 Tokuda Yasokichi III became Living National Treasure in 1997 and is recognized for work with Saiyu, glaze color gradation technique. 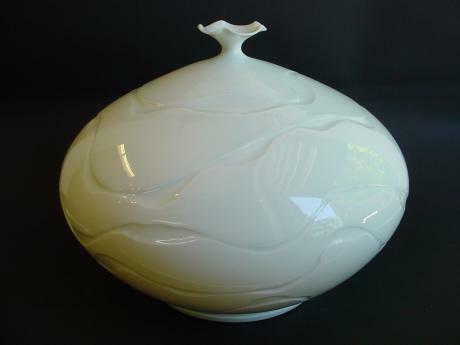 Comes with TOMOBAKO, original artist sign..
Japanese 20th century large white celadon vase. 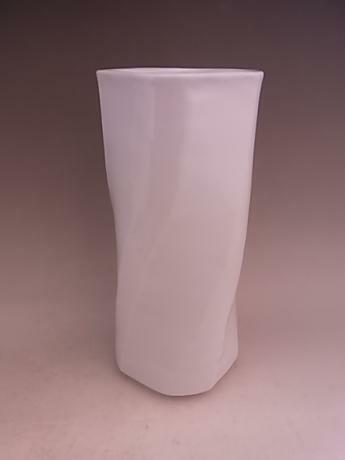 The vase has the design of thick white vertical forms that have fine white lines on their tops and bottoms. 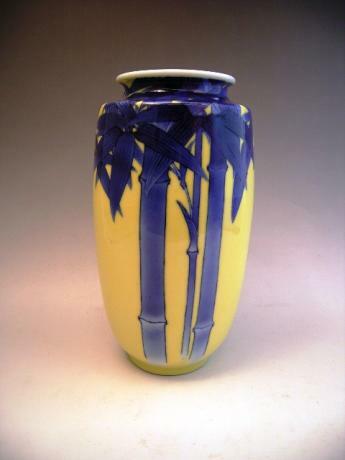 The thick and thin areas of these vertical forms form a zig-zag design on the top and bottom of the vase. The vase is made by artist, NONAK..
20TH CENTURY WHITE CELADON PORCELAIN VASE BY YAMAGUCHI MIKIHIKO. 20th Century white celadon vase. Signed by artist, YAMAGUCHI MIKIHIKO, member of NIHON KOGEI KAI. Artist was born in 1954. Comes with TOMOBAKO, original artist signed box. 10.5" tall by 12.5" wide. 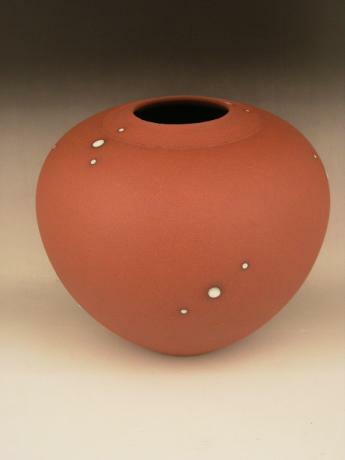 Japanese 20-21st century earthenware terra cotta colored vase with white glaze spots by Ito Shin. Ito Shin was born in Chiba, Japan in 1952 and has lived in worked in Mashiko in Tochigi Prefecture. He studied under KIKUCHI AKIRA, another Mashiko artist. 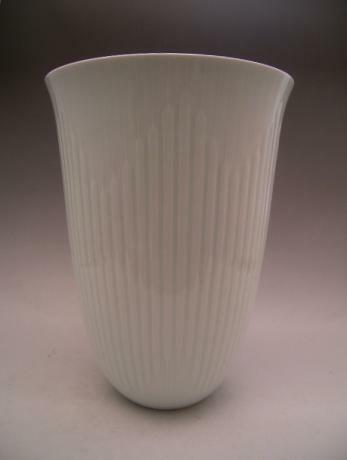 He became independent and opened his own ..
Japanese 20th Century INOUE MANJI white porcelain with incised design vase. The design is incised into the porcelain with pale green glaze. Made by master artist, INOUE MANJI, Japanese National Treasure. 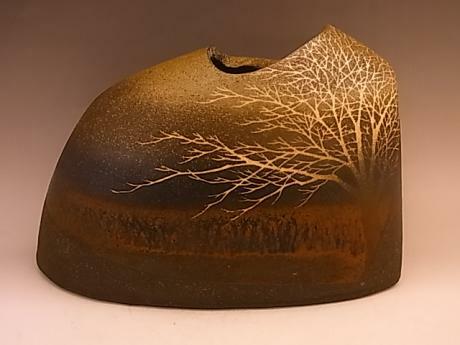 INOUE MANJI was born in 1929, was selected for his work with HAKUJI, white porcelain and is ..
Japanese late 20th century (actually made in 1994) ceramic vase made by ceramicist SAEKI MORIYOSHI. SAEKI MORIYOSHI was born on August 4, 1949. He lives and works in the MASHIKO area in Tochigi Prefecture. He is now teaching at the famous Tokyo School of Fine Arts. 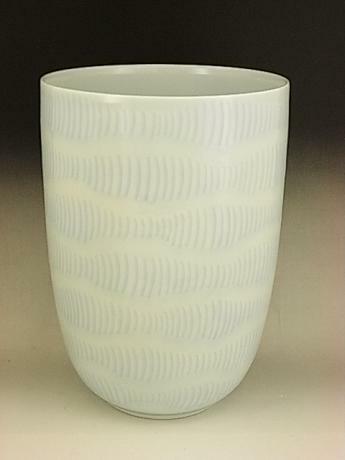 He has rewarded many awards ..
Japanese 20th Century INOUE MANJI white porcelain vase. Made by master artist, INOUE MANJI, Japanese National Treasure. 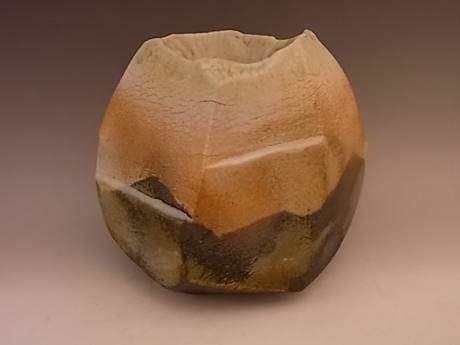 INOUE MANJI was born in 1929, was selected for his work with HAKUJI, white porcelain and is still actively producing his porcelain works of art. Signature of artist on base. Come..